Portability of Estate Tax Exclusion — Did Congress Guild the Lily? As part of the 2010 Tax Act, Congress enacted a statute allowing a surviving spouse to utilize the unused portion of the predeceasing spouse’s lifetime estate tax exemption. This option offers protection to spouses who have not engaged in any estate planning. However, persons with estates large enough to benefit from the provision would in most cases be remiss in relying solely on the efficacy of portability as the cornerstone of their prudent estate plan. The problem which Congress sought to ameliorate would arise where the predeceasing spouse made a sizeable bequest to the surviving spouse of the entire estate. While this disposition would succeed in eliminating estate tax at the death of the first spouse by virtue of the unlimited marital deduction, it would also entirely waste the lifetime exclusion of the predeceasing spouse. Before the enactment of the portability statute, spouses who had not done any estate planning could find themselves in a situation where the estate of the surviving spouse could needlessly incur estate tax liability if the estate of the surviving spouse — now augmented by the estate of the predeceasing spouse — exceeded the applicable exclusion amount. The concept of “portability” allows the estate of the surviving spouse to increase the available lifetime exclusion by the unused portion of the predeceasing spouse’s lifetime exclusion. Thus, the applicable exclusion of the surviving spouse is augmented by that of the predeceasing spouse. In technical terms, IRC § 2010 provides that the Deceased Spouse Unused Exclusion Amount (“DSUE,” pronounced “dee-sue”) equals the lesser of (A) the basic exclusion amount, or (B) the excess of (i) the applicable exclusion amount of the last such deceased spouse of such surviving spouse, over (ii) the amount of the taxable estate plus adjusted taxable gifts of the predeceased spouse. The basic exclusion amount for 2013 is $5.25 million. If the lifetime exclusion amount were to decrease, the basic exclusion amount would also decrease. Portability is not automatic. To benefit from portability, the executor of the estate of the first spouse to die must timely file a federal estate tax return, federal Form 706. The mere filing of the form will result in an election to utilize portability — nothing further is required. The election, once made, is irrevocable. If the executor wishes to forego portability, this can be accomplished either by failing to file Form 706 (if no return is otherwise necessary) or by stating on the Form 706 that the election is not being made. 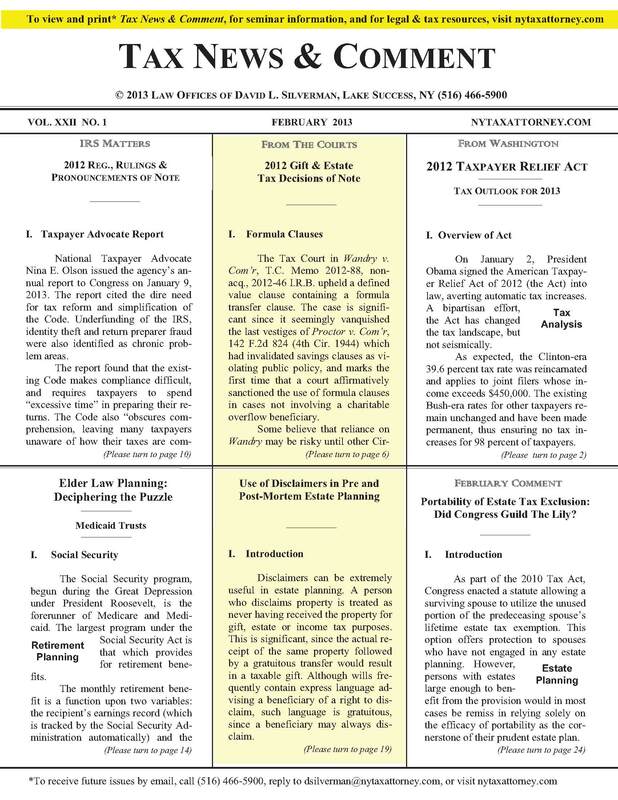 If there is no executor, then a “non-appointed executor” may make the election on the timely filed estate tax return The statute is quixotic in that a “complete and properly-prepared”” estate tax return must be filed without regard to whether or not the decedent’s estate plus adjusted taxable gifts exceeded the exclusion amount at the time of the decedent’s death, thereby requiring a return. However, if a return is not otherwise required, the executor may estimate the size of the gross estate to the nearest $250,000. Similarly, if property qualifies for the marital or charitable deduction, the executor must only provide information sufficient to establish the estate’s right to the deduction. Form 706 now includes a worksheet on which the DSUE amount is calculated. The DSUE amount of a decedent with a surviving spouse is the lesser of the following amounts: (i) the basic exclusion amount in effect in the year of the death of the decedent; or (ii) the excess of — (A) the decedent’s applicable exclusion amount; over (B) The sum of the amount of the taxable estate and the amount of the adjusted taxable gifts of the decedent, which together is the amount on which the tentative tax on the decedent’s estate is determined under section 2001(b)(1). For example, if the decedent spouse died with an estate of $1 million having made adjusted taxable gifts of $1 million at a time when the applicable exclusion amount was $5 million, his DSUE amount would be $5 million less $2 million, or $3 million. The DSUE amount of the surviving spouse may change if the surviving spouse remarries. In the event of remarriage, two possibilities exist: Either the surviving spouse will predecease the new spouse or the new spouse will predecease surviving spouse. If the surviving spouse predeceases, her DSUE amount will be the same as if she had not remarried. On the other hand, if her new spouse predeceases her, then the DSUE amount will be calculated by reference to the estate of the new spouse. This could be of significant consequence if, prior to his death, the new spouse had made lifetime gifts and exhausted his lifetime exclusion amount. There is a further limitation: When calculating the unused exclusion amount of the predeceasing spouse, only that portion of the predeceasing spouse’s own basic exclusion amount may be used. In other words, the predeceasing spouse’s unused exclusion amount will not include any portion of that spouse’s “inherited” unused exclusion The upshot of the manner in which portability is calculated is that issues of portability should now be considered in drafting prenuptial or post-nuptial agreements in second or third marriages. While portability was intended to simplify estate planning, many issues involving portability necessitate further planning. At the death of a surviving spouse whose estate tax return claims a DSUE amount, the IRS may examine the earlier estate tax return of the predeceased spouse for the purpose of adjusting the DSUE amount calculated on that return. However, if the three-year statute of limitations on assessment has run on the return, no changes to the estate tax liability of the predeceasing spouse may be made. IRC § 2010(c)(5)(B). One situation where portability is clearly desirable is where assets are jointly owned. If all marital assets (e.g., real estate, brokerage, and bank accounts) are jointly titled, portability will ensure that the exemption amount of both spouses is utilized to the extent of one-half of the value of the ointly-held property at the date of death of the first spouse. Portability is useful where no planning has been done, and the will contains no credit shelter trust. In this situation, portability can act as a proxy for a credit shelter trust. Even where planning has been undertaken, some assets, such as a retirement account, may not be ideally suited for funding a credit shelter trust. Here as well, portability can significantly ease problems of estate administration. Neither New York nor any other state has yet to enact an analogue of portability at the state level. New York has a $1 million estate tax exemption. Spouses considering portability should consider disposing of at least $1 million by means of QTIP trust or outright disposition at the death of the first spouse to avoid wasting the $1 million NYS exclusion. If the surviving spouse is young, then future appreciation in inherited assets will not escape the estate tax, as they would if a credit shelter trust were employed at the death of the first spouse. This is because the assets will be included in the estate of the surviving spouse at her death. It has been suggested that this problem can be mitigated by having the surviving spouse make a gift of the DSUE amount to a defective grantor trust. This gift would presumably solve the problem of future appreciation and would have the added benefit of enabling the surviving spouse to pick up the annual income tax tab of the trust without incurring gift tax liability. The assets in the trust would grow without the yearly imposition of income taxes. The problem with this approach is that the if estate tax disappears in 10 or 20 years — as many now expect — the IRS will likely concentrate its compliance efforts on increasing revenue from income tax audits. Assume that in 10 or 20 years the surviving spouse dies at a time when there is no estate tax. Assume further that Congress or the IRS decides that a realization event for income tax purposes occurs when the grantor of a grantor trust dies. In that case, immense amounts of appreciation will become subject to capital gains tax at the death of the grantor. The principal problem with foregoing the credit shelter trust in favor of the gift by a surviving spouse to a grantor trust is that a substantial tax risk is assumed in exchange for accomplishing little economically. Why should a taxpayer needlessly incur the risk of an income tax event when not much is to be gained by taking the risk? In the case of a young spouse whose death may not occur until after the estate tax is repealed, electing portability is simply not prudent. If a credit shelter trust is employed, full use of both exclusions could be assured. There is of course a basis trade off with the use of a credit shelter trust. While portability will ensure that all of the assets included in the estate of the second spouse will receive a step up in basis, the assets funding a credit shelter trust will continue to appreciate and will not receive a basis step up when the second spouse dies. Although Congress provided for portability of the estate tax exemption, and the provision is coordinated with lifetime gifts, Congress did not elect to include in the concept of portability the generation skipping tax (GST) exemption. This could be a significant drawback in estates requiring the use of the GST exemption to increase the amount of assets passing in trust to grandchildren and future descendants. A catch 22 may arise where an estate tax return is necessary only to calculate the DSUE amount for the surviving spouse. The executor may not wish to incur the cost of filing the estate tax return, since only the surviving spouse will benefit from the filing. If discord exists between the surviving spouse and the children of the deceased spouse, and one of the children is executor, he might decide not to incur the expense of an estate tax return. Although there was hope that the IRS would provide a “short form” 706, this has not yet occurred. It is unclear what remedy, if any, the surviving spouse would have in this situation. It is clear that if no estate tax return is filed, the deceased spousal unused exclusion amount will be unavailable to the estate of the surviving spouse. Another problem could arise if the predeceasing spouse has children from a prior marriage, and utilizes a QTIP. If a QTIP trust is implemented for the benefit of the surviving spouse, and a portability election was made, the surviving spouse would get the benefit of the DSUE upon her death. During his or her lifetime, he or she could makes gifts which would exhaust his or her applicable exclusion amount plus the inherited DSUE. At the death of the surviving spouse, the QTIP would be included in the his or her estate, and estate tax liability would arise. Those responsible for the payment of the estate tax would be the QTIP beneficiaries — the children of the first spouse to die. If the exclusion plus the inherited DSUE were exhausted, estate tax liability would arise, and the children would be liable for that estate tax. If, on the other hand, a credit shelter trust had been in place at the death of the first spouse, the children would have benefitted from the applicable exclusion amount available to their estate of their parent. The credit shelter trust may also be preferable to portability with respect to the issue of IRS audits. Since the IRS is less likely to audit an estate that will produce no estate tax revenue, assets funding a credit shelter trust would appear less likely to attract an IRS audit. On the other hand, the IRS would be free to audit the estate of the second spouse where portability had been elected. This entry was posted in Estate Planning, Lifetime Exclusion, Portability and tagged advantages of portability, applicable exclusion amount, credit shelter trust, credit shelter trust vs. portability, deceased spousal exclusion amount, disadvantages of portability, DSUE, electing portability, estate planning, estate tax, estate tax exclusion, estate tax return, gift tax, gross estate, GST, ILIT, IRS estate tax audits, new york estate tax, Portability, QTIP election, QTIP Trust. Bookmark the permalink.